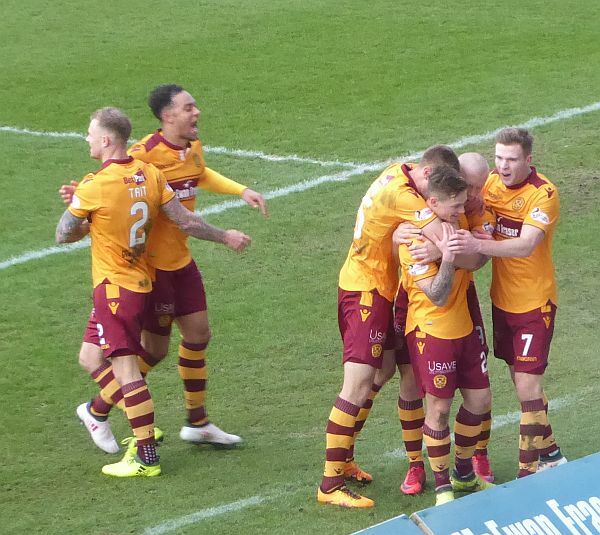 Motherwell marched into the sixth round of the Scottish Cup with a convincing 2-0 win at Dens Park. Goals from Tanner and Main were backed up with a clean sheet to send the 1,147 'Well fans home happy. Tanner got the game underway as we faced the big travelling contingent behind the Dundee goal. Concern about Campbell's hamstring kept him out of the team but his replacement not only kicked off but he scored the only goal of the first half. There were chances at either end though not much flowing football as the midfielders tended to do more closing down than productive work. Early action arrived when Kipre headed Tanner's free kick across the goal. Rose headed the ball into the net but the assistant flagged. Inside a minute Moussa almost beat Carson but his headed effort flashed wide of the post. Main unleashed a fine 25 yard strike that shaved the post before Ciftci came close from Cadden's cross. But our number nine played his part in the opener when he set up Tanner in 32 minutes. His show was well hit from 25 yards, low and central. The bounce seemed to decieve Parish and much to our delight squirmed under him to give us a one goal lead at the break. Dundee pushed hard at the start of the second half but they found no gaps in the stout 'Well defence. Their best chance came in the 50th minute when Moussa fired a powerful shot that allowed Carson to show why his is a highly rated 'keeper. His save sparked chanting of his name from behind his goal. The game was over as a contest a minute later. A high deep ball saw Main and Holt rise for a touch as Parish came from his goal. Our man got to his head to the ball and with the goal unattended we watched as it trundled into the net. Dundee were beaten and they look it. We were able to see out the game in comfort and cn now look forward to Sunday's draw.